A little more than a week after U.S. Attorney General William Barr released a four-page memo purporting to summarize Special Counsel Robert Mueller’s two-year investigation into Russian interference in the 2016 election, some of the 19 attorneys from Mueller’s team are now saying Barr’s memo doesn’t tell the whole story. Journalists on Wednesday night broke the news, and now the U.S. House of Representatives — controlled now by a Democratic majority — is stepping up its insistence on receiving the entire report, which reportedly contains nearly 400 pages of information. In addition, House Democrats are now pushing to get six years of President Trump’s tax returns. They say they’re doing it to make sure the president doesn’t have any foreign investments that might create a conflict of interest for the president. Finally, journalists also reported Wednesday that a Chinese national possibly working for Chinese intelligence found her way into Mar-a-Lago last weekend carrying listening devices, two passports, a thumb drive loaded with malware and four cellphones. She got in by telling Secret Services that she simply wanted to use the pool and knew someone who was a member of the private club, which charges a $200,000 entry fee and $14,000 in annual dues. In its first month on movie screens around the world, “Captain Marvel” has become the first superhero film starring a woman in the lead role to gross more than $1 billion. Brie Larson stars as the eponymous captain, an extraterrestrial Kree warrior fighting an intergalactic battle between her people and the Skrulls. She is aided by Nick Fury, played by Samuel L. Jackson. Another study was released this week that indicates that charter schools may not be the panacea that Secretary of Education Betsy DeVos touts them to be. Religious freedom or anti-gay discrimination? The Texas Senate this week approved a “religious refusals bill” that would allow for professionals such as social workers and attorneys to refuse to work with LGBTQIA+ persons based on “sincerely held religious beliefs.” LGBTQIA+ advocates claim the bill provides professionals with “a license to discriminate.” The bill does not extend to healthcare providers or others who make life-and-death decisions. With one exception, Republican senators voted for the bill. With one exception, Democrats voted against the bill, which still needs one more vote in the state Senate before it can be deliberated in the Texas House of Representatives. If it passes there, it would be sent to Gov. Greg Abbott, a Republican, who could sign it into law. 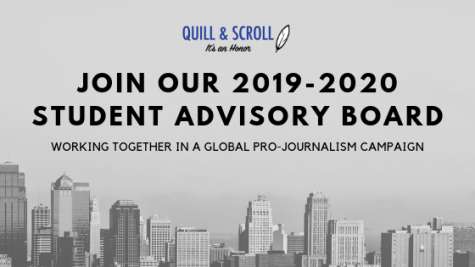 If you are a member of Quill and Scroll — or if you will be inducted between now and Sept. 1 — you are eligible to serve on the Quill and Scroll Student Advisory Board for 2019-2020. The SAB works with the Q&S executive director on identifying special projects that Q&S can undertake to promote excellent, ethical journalism at our 11,000 chapters worldwide. This year’s SAB worked with the Journalism Education Association in promoting Scholastic Journalism Week. The application can be found here. April 10 is also Quill and Scroll’s Founders Day. 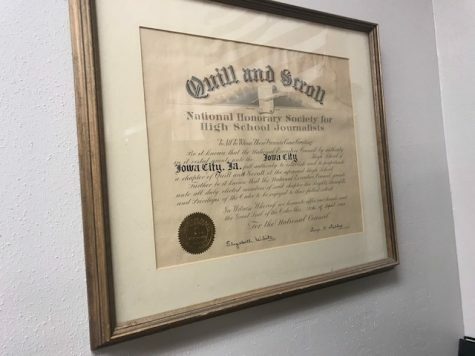 April 10, 2019 will be the 93rd anniversary of the day in 1926 when a group of 19 high school advisers from Wyoming to Wisconsin met in Iowa City to form Quill and Scroll National Honor Society for High School Journalists. We’ve since become the International Honor Society for High School Journalists, but the goals remain the same: to honor and promote outstanding, ethical journalism among scholastic journalists. If you or someone you know would like to help in that endeavor, point them to the Scholarships page on our website and point out the “Donate” button right at the top. Any money donated will go toward funding students who plan to study journalism in college. Quill and Scroll offers one journalism adviser at a charter school to earn a $500 scholarship for continuing education. Please go to this webpage to look at the requirements and to apply for the award. Students wishing to earn up to $1,500 in scholarships from Quill and Scroll have until May 10 to complete their applications. National winners of the Yearbook Excellence Contest or the International Writing, Photography and Multimedia Contest and Blogging Competition are eligible to apply for one of the Edward J. Nell Memorial scholarships in journalism, or one of two George and Ophelia Gallup awards. 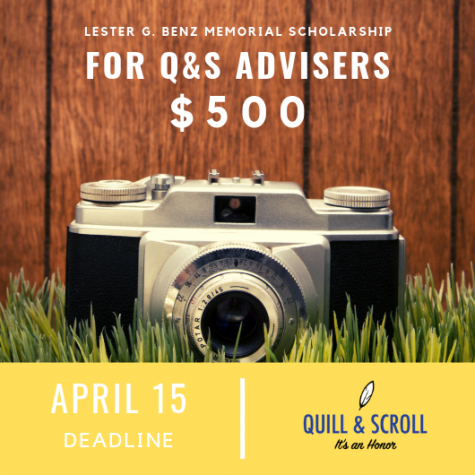 The Richard P. Johns Scholarship is open to all Quill and Scroll seniors, including those who did not enter contests. Postmark deadline for applications is May 10. All scholarships can be used for tuition, room and board at any college or university. Recipients must major in journalism or a related area of communications. The scholarships are awarded for the freshman year only and are paid in two installments (fall semester and spring semester). Get your orders in, make your nominations for induction … now! We highly encourage any schools wishing to send in orders of pins, t-shirts, cords, etc. to do so sooner rather than later. After April 1, our office becomes very busy with an large influx of orders; as a result, we ask for your patience and allow at least three weeks for your order to be processed and completed. We also need a form of payment (check, purchase order, credit card payment) before we ship. Here’s where you can find the order form. The News Media Evaluation Service entry will be open April 1 to June 15. Get your publications ready for submission as soon as possible. If you paid for your NME entry with your entries into the Writing, Photo and Multimedia Contest, then simply send your entry forms and publications (if you’re having print publications evaluated) before the deadline. If you didn’t pay with your entries into the Writing, Photo and Multimedia Contest, then you’ll have to go the NME page to take care of that. To view a complimentary guide for your own entries on the actual content and judges comments from the 2018 NME Contest, click here. Journalism teachers be like: “I have to re-evaluate my entire life now,” and “What’s next? The Oxford comma?” Please be kind to them until they get used to the new guideline. Seriously, who says cats don’t know or can’t learn their names? Japanese researchers released a study that says cats can learn their names, but they still might refuse to come most of the time. There was no word about the efficacy of using a can opener while calling their names. You probably already knew this, but now researchers have confirmed that older Americans are much more likely than young people to fall prey to fake news on social media, to believe it and to share it with their friends and family. You already knew your parents and grandparents were nuts, so what’s the problem? Well, older Americans vote at massively greater rates than young Americans, so their misinformed opinions too often hold sway in our democratic republic. If you’re young, help older people understand the perils of social media. And VOTE! Your voices aren’t being heard enough in the halls of power. An elementary school in Elkhart, Indiana is working with a nonprofit to “rescue” food made but never served by the school and packaging for students to take home, if the students live in food-insecure households. “There wasn’t anything to do with the food, so they came to our school three times a week to rescue the food,” one school worker said.